While the Labour Party and its leader still languish in the doldrums of public opinion, some newer members of the Labour caucus are making a pretty good claim to rehabilitation. In fact, if Labour is ever again going to appeal to the public as a viable alternative government, it could largely be thanks to this band of relatively new MPs – headed by Grant Robertson, Charles Chauvel, Clare Curran, Phil Twyford and David Shearer. The members of this group share at least two things in common – a background in activism that helps them to function better in opposition than some of their colleagues, and a lack of any stigma from being seen to play a significant public role during the Clark era. 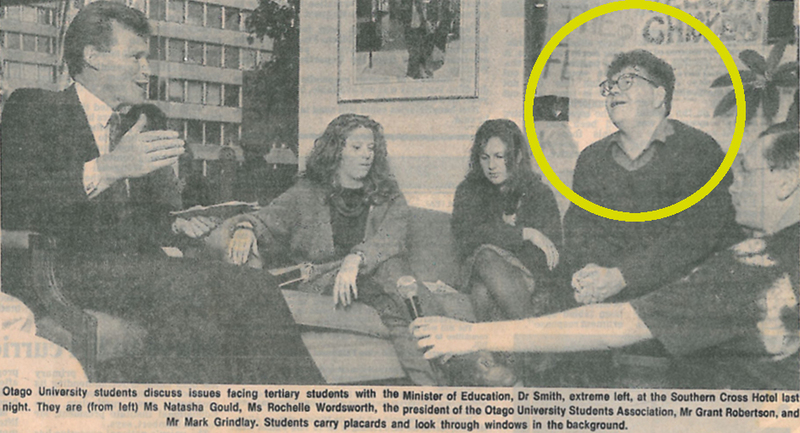 I say ‘public’ because Robertson did play a key back room role in the Prime Minister’s department for Helen Clark, to the point where he reportedly earned the nickname “H3” – behind H1 ( Clark) and H2 ( Heather Simpson). 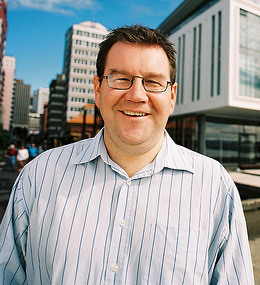 During his former career, Robertson was an MFAT diplomat at the United Nations and managed our foreign aid programme to Samoa. These days, he is the MP for Wellington Central – and, at 39, is still a relatively new face to voters. Werewolf editor Gordon Campbell recently caught up with Robertson to ask him about life in the Labour trenches. Campbell : One of the current government memes is that public service jobs and spending was out of control under Labour, especially during its last days. True? Yes, but the government keeps hitting the theme that this job growth was mainly in back room bureaucrats. Education bureaucrats up by 40% versus 12% growth in teacher numbers, central health bureaucrats up by 51% as opposed to a 28 % growth in core health professionals. The other leg of their criticism is that there was a six-fold increase – in one year – in those earning over $300,000…What’s your response to that? Labour means strong public services. I’m proud of that – I think that’s a good thing. There was always going to be a need to invest heavily…People often forget that there were lots of stories in the late 1990s about the running down of public services in New Zealand. The number of public servants is only one way of looking at that. There’s the quality of public services as well. Talk to the social workers in Child, Youth and Family – and in the late 1990s they’d say ‘I’m spending a quarter of my time doing administration and that means I’m not spending time with families.’ We make no apologies for investing in public services, and for needing to re-balance where we were. But I reject the notion that it got completely out of control. But given the pay numbers for the chief executives – and for others in the bureaucracy – you could argue that while Labour meant well, you were not good managers of the bureaucracy that you fostered. I don’t necessarily accept that. On pay, I think there is something to that, around the pay for chief executives. I do think there was a a bit of inflation there…Were we not good managers of the bureaucracy? They were implementing the programmes that we were putting in place. We wanted to do it! And were they being overpaid for doing so? Are you saying those pay levels were due to us being in the autumn of the boom ? Yes. And again, those pay levels were happening relative to the rest of the economy. You can put today’s lens on this and make some of those comments, but I don’t accept the underlying principle. Putting on your Wellington Central hat, how many public servants have lost their jobs in the Wellington region? Looking now at the impact of those job cuts upon the local economy…Is there a risk that this will repeat the same recessionary impact that the benefit cuts had in 1991? Well, I’ve spoken to business leaders in the Wellington area who say that the retail [sector] is noticing it. Yet you don’t hear much about that from Mayor Prendergast and the council. Do you think they should be being more publicly concerned about the economic impact of the public service job cuts? I’d like to hear more from them about it. And from the Chambers of Commerce as well…I haven’t really heard anything from the council as such, but from the Chamber I’ve certainly heard people saying well, we’d be concerned if there was an impact, and it is now starting [to have that impact].But politically, they have taken the stance that well, we also want a more efficient public service. I want a more efficient public service, too. We’re not on a different page there. So yes, it is an issue for Wellington, but a lot of the job losses aren’t just happening in Wellington. Even the core public service is 60 % outside Wellington – whether it be in the Tertiary Education Commission or the Ministry of Fisheries, or bio-security officers in Timaru, or whatever. You may well be in opposition for the next five years at least. What counts as job satisfaction when you’re on the sidelines, looking on? As an electorate MP there’s a huge amount of job satisfaction in simply being able to make a difference to peoples lives. Even in an affluent electorate like Wellington Central you get a real diversity of people coming in the door. At the national level, aren’t you reduced to the small gains of sniping from afar? It is difficult in opposition to set the balance. I’m relatively new, and am still working out what the balance of the opposition role is. Its very important to hold people to account. That’s important, whether or not you have small victories along the way. Look, in this initial period, this is a time for Labour to re-assess its policy, and to look at new ideas, and different ways of doing things…Opposition is an important part of our democracy, but its not one that I want to spend all my career in. Do you feel sometimes as if you’re trapped on the treadmill of small gains, and Beltway arm wrestling – much of which is completely irrelevant to the wider electorate. Do you derive much satisfaction from the close quarters fighting that goes on around here? I don’t think’ satisfaction’ is the right word. I do see some of that as being part of that wider democratic agenda. I know its not something the public is hugely interested in, or anything like that. But it is part of holding people to account. The question of ‘personal’ satisfaction from it is a bit different. It is part of the job. Labour has taken a hit on the credit card issue, down to only 30.5 % in that last poll. Hasn’t that cancelled out any gains from the perception of the Budget as being ‘tax cuts primarily for the rich’? Possibly. The downside of the credit card issue is that it reminds people again why they didn’t vote Labour in 2008. Except National was up – to 55%. Yeah that’s true they were up in that particular poll. But you know, the next time that it’s Tim Groser or its Phil Heatley or it’s Murray McCully then they might take the hit. I do have a genuine concern about the cynicism, and that this fuels the cynicism about politics, generally. I was collecting for the City Mission at the supermarket on Saturday afternoon –and every second person had something to say around the credit card issue. Normally, if I’m out collecting for various charities I’ll get one in every five or six people who’d want to stand and chat about a particular political issue…So the fact that people have engaged so much with this, its terribly, terribly sad. I’ve kept saying to people – it was wrong. Spending outside the rules was wrong. But there’s also more to it than that. It was the fact it was public money. People really, really feel that it was their money, and it was misused…and extravagantly spent by people. We’ve got to do better, so people can feel it is worthwhile to engage with politicians. Is the caucus split on whether its priority should be to try and build bridges with the Maori Party ? Primarily, are you in embrace them or attack them mode? So Labour’s interest in exempting food from GST wasn’t an olive branch to the Maori Party [who have a private members bill on that subject] ? Isn’t the wider reality that for the foreseeable, Labour is always going to be the second cab off the rank for Maori voters? Not when you look at the party vote, necessarily. No, I don’t necessarily think that at all. We faced the enormous difficulty of the seabed and foreshore issue when in government And obviously, for a number of Maori that was a watershed-type moment, in terms of their political support. Where we are now trying to do is engage with Maori with that as…being there, as being part of our history, and to try and look forward, to. the bread and butter type issues. Do you think the Maori Party sold out over the seabed and foreshore? Doesn’t that underline the fact that they seem to have carte blanche from their constituents ? That’s a question that people who are engaging everyday with Maori and the Maori MPs could probably answer better. I’d be surprised if that were true. I think Maori will be looking at them and saying – but you voted for a Budget that’s put up GST, that’s given tax cuts that disproportionately go to the wealthy, and not to the needy. And what did we get in return? We got a law that is pretty much the same, with – obviously – a high customary title test chucked in as well. I think a lot of Maori will be questioning that. I don’t think they’ve got carte blanche. Nobody in politics does. Lastly on this point, Moana Jackson is saying the legal hurdle to gain customary title is so high, few Maori will ever surmount it. Yet Treaty Minister Chris Finlayson is saying that thousands of kilometers of shoreline will eventually be awarded customary title. Who do you think is more accurate? That question got asked in parliament today. Te Ururoa Flavell asked almost exactly that question. The test was always high. The Court of Appeal said that, initially. But it is still possible – and the Ngati Porou negotiations that happened under our government show for some iwi, that it will be possible. Beyond that…this is one of the issues that the Maori Party have of course, and that Hone Harewira represents in many ways – is that for a lot of iwi, even if things had sailed straight through the Court of Appeal, they would still have struggled to meet any kind of reasonable test of their long term association with the coastline and seabed. So inevitably I’m sure you will ask me then – why did we do what we did in 2004 ? I really don’t want to re-litigate that decision here. But it was legitimately asked in Parliament today. And lots of numbers are being chucked around. Some iwi know they will meet it [the customary title test] and Ngati Porou is the obvious example.. When the Labour caucus looks across at Hone Harewira and after watching him function within this government for 18 months, is there a sense in which he is just playing the ‘house radical’ role within the Maori Party ranks ? I certainly think it partly serves their interests to have him out there pushing the boundary and saying ‘ No , I don’t think we went far enough.’ By splitting the Ministers – Tariana and Sharples – off, I think that does allow them to play a couple of different games. I don’t know if that fits your definition of ‘house radical.’ But he is playing a role. Do you think he’s doing it consciously? I’m sure he knows. He’s doing what he wants to do. That’s Hone, he wouldn’t do what he didn’t want to do. From the point of view of the Maori Party more generally, while he can be difficult for them, he’s also quite useful. And because he’s playing that useful role for them, they give him a longer leash at times? You’ve talked recently in one of your blog posts about the need for Labour, and Labour supporters to become more economically literate. Would that include an acceptance that the electorate will inevitably have to embrace tax increases in future, to deal with the reality of rising costs and an ageing population? I don’t know about ‘inevitable.’ I think the whole way we view the tax system does need attention. In order to keep the kind of services we want, we obviously have to think about broadening the tax base – and my preference is to be able to grow the economy in a way that means we don’t have to keep hiking up taxes. But there are certainly going to be times – as there was in 1999 – when we look and say well, actually if we want to do these things we have to increase taxes. But I’m not setting the Labour Party tax policy. I respect the question that you’re asking, particularly around super entitlements and so on. That we do have an ageing population, and that we are going to have to make some very real decisions. The question was also about what you think ‘economic literacy’ actually means. Because when it comes from Labour – and especially during the nine years of the Clark government – it seemed to be that ‘economic literacy’ meant accepting the status quo. That’s not what I mean. That post I did was about another post – which was about saying that it doesn’t just mean adopting the conventional economic theories of the centre right, or the New Right. 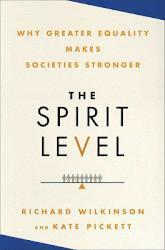 It actually means owning the economic discipline, and the two examples I raised were the Stiglitz and Sen work on genuine progress indicators, and the stuff on [the Richard Wilkinson and Kate Pickett book] The Spirit Level. There are people talking economics from a progressive point of view, and we need to be able to understand that, and then articulate that. Actually, Chris Trotter’s comments on that post were almost what you’re asking in that question –and somebody else responded to that by saying that we have to own economics and be able to talk the general language of it. Isn’t this another example of Labour running to catch a bus that’s already left the station ? You mention The Spirit Level – and the gist of that is about the social impacts of income inequality – but the Greens have been explicitly banging on about that for about the last nine months. You’re a bit late on that [book], aren’t you? We’ve certainly been trying to talk about income inequality. That’s what the whole ‘ The Few and the Many speech [by Phil Goff in January] was about. Whether we’ve used the words ‘income inequality’ as often as we might, sure …but the general precepts, yes. You were working in the PM’s department when the personal attacks on Helen Clark began. With hindsight, they were largely successful weren’t they ? Oh, they probably contributed to some peoples’ views of Helen, yes. And thereby of the government, sure. Point being, what was formerly seen as an asset became negatively perceived by significant numbers of voters. By contrast, the Labour attacks on Key have been seen to be entirely counter-productive. Why the difference? There are lots of assumptions in that question. Rather than pick them out and challenge them, I’d say that a lot of this is to do with where we are in the cycle, at this stage of politics. Helen was towards the end of nine years as a Prime Minister, thirteen years as a leader, a long time on the political stage. Key is in the early years of his prime ministership, and at an early point on the political stage. I think those [personal attacks] matter more at different times. Well, the assumption I was making was that Key’s personality is seen as being a major political asset. Can Labour win an election without changing that perception? I think we can, on the grounds of where people are at, as the result of policies. Those things eventually will out, in my view. While I totally accept what you’re saying about Key’s personality and how popular it is at the moment, eventually whether people have jobs and how they feel about their standard of living and their kids’ education and the health system, do matter. Obviously though, we are still a long way from the “Anyone But Key’ tipping point. What will get people there? Those things we’re talking about. They matter a lot more in the end, than personalities. Eighteen months in, people are still getting to know Key. When he arrives in a town, it’s still the first time he’s been to the town, maybe the second time since he became Prime Minister. He’s an enormous asset for the National Party, and he’s good at photo opportunities…But in the end, people live their daily lives and they get worried about the bills, the jobs and the kids, and health. And that will happen. By the same token, why don’t people warm to Phil Goff? Its funny when you’re with Phil and out in public with Phil, people do warm to him. Moving round the country and cities, he’s a really nice guy. People like him and he speaks well. The media, in the way – and I’m not blaming the media – but the way in which the media portrayal of him is happening….I don’t think its giving him a lift in the polls. I mean – it’s the that point you made to me earlier – that the role of an opposition politician is normally to be a 20 second sound bite in a story, saying something negative. It is actually very hard for an opposition leader to not be in that role. You give a five minute interview, two and half minutes is about the positive things Labour is thinking, and 30 seconds of it was negative and that’s the role the opposition leader is kind of expected to play. Its one of the reasons why we’ve worked really hard to do things that don’t necessarily have to be news filtered. Its why we’ve gone on the bus tour. Its why Phil is out and about a lot during the weeks. Except its not working, is it? There’s an inference in what you said earlier, that over time people are fickle enough to elect anyone. No, I don’t say that. I don’t accept the fickle thing, I think that’s very pejorative. I think people do eventually – history tells us this – that they eventually decide that it’s time to move on, and they want something different. That’s not just fickleness, there’s lots of factors involved in that. You’re part of this rising group of MPs in the Labour ranks – Charles Chauvel, Phil Twyford, Clare Curran, David Shearer and yourself, who are commonly picked out. Do you regard yourselves as a group? Do you work together as a group, outside caucus? Work together as a big group ? No. Individuals or some parts of us are working on something like say, Red Alert. Or maybe on a new policy initiative. And we meet as a support group. But that’s mainly as a support group, about being new. Is that a once a week thing? Once a session. It was once a week, but we all got too busy. You’re now the spokesperson for tertiary education. Funds are never adequate for tertiary education, student allowances are never adequate, either. As a student activist, you were probably saying the same thing to [then Education Minister] Lockwood Smith back in 1993. What should the government be doing now, that it isn’t ? That’s right. It’s a perennial debate about the resources that are required to get tertiary education right from a student point of view and an institutional point of view. Having said that, the last two years have been a very particular time where there was an opportunity for the government to use tertiary education to help deal with the recession…..and to harness the 60,000 young people out of work and make sure they got in and got a tertiary education. The government is very fond of looking across the Tasman – and that’s what the Rudd government in two successive Budgets has done. It has really put money into tertiary education and said that this is the best thing we can hope to get out of this slowdown in the economy.. But it hasn’t happened at all here. What we’ve got is a situation where Victoria University and other institutions have shut the gates for the second semester of this year. Almost every university has said we are going to apply restrictions beyond the University Entrance restriction and look at the over 20s as well..Polytechs are absolutely groaning under the weight of student demand. What Stephen Joyce has chosen to do – I think – is view the sector as a place that he can take money from. So the student loan changes…there was a nice little table that the government produced of the $1.8 billion that they’ve saved…Some of it , he would argue has been ploughed back into the system, but very little. 765 places in total. Divvy that up among the polytechs and universities and its tiny. I think it works out as less than 100 places for each university and less than 20 for each polytech. Its nothing. Shutting the door at universities on students who actually had the qualifications to attend, seemed like a major seismic shift in entitlement to an education, one that New Zealanders have always taken for granted. How come it hasn’t had more impact? Yeah, it got a bit of a run when it was first announced…I absolutely agree, It is a major change and at the very, very least, Stephen Joyce as the Minister needs to be leading the debate as to why it has happened, and what it means. There’s a short term issue of what happens in the second half of this year/first half of next year. I’ve had people in my electorate office, entire families had uprooted themselves for a variety of reasons, one of which was that their son was going to be going to Victoria University. So, there’s a very immediate issue around the people involved. Then there’s a longer term issue about what place does tertiary education have in New Zealand’s future, and in our economy and society ? Its not just about universities, its about polytechs and industry training. And there are some potential solutions that don’t involve enormous amounts of money, around the institutions working together a little bit more. And about how people can stay within the system and keep training and keep learning…That needs leadership, and I’m not seeing that from the current government. During the first 18 months of the Key government it has gone far further, far faster to enact its ideological agenda than the Clark government did in nine whole years. Why was the Clark government so relatively timid? I’m not sure I totally buy that. I’ll answer the question a different way. I think Helen Clark had a pragmatic style that was born of her time in the fourth Labour government. And she –rightly – identified that people didn’t like the quantum leaps of Roger Douglas. She didn’t like the policies either, but she didn’t like the pace. She came in, in 1999, with a clear programme, and a lot of things happened. That’s why I partly reject the question, because I think a lot did happen. Part of your point though, is that the pace of the government was dictated by Helen’s style. She was a careful politician as Prime Minister and a relatively pragmatic politician, though I still thjnk a principled one. It is true that with John Key…part of his personality, and I hesitate to use the word ‘ gambler’ because it has got me in trouble in the past. But he is a person who has a slightly different style. The point being, almost every week seems to see a major ideological step on its agenda being taken by this government. Yeah, but if we unpick those ‘Every week something seems to happen’ moments – and I absolutely get what you’re saying – a lot of the time it is that “we’re thinking about this, we’re investigating this, we’re looking at this.” Some of those things aren’t actually happening. There is a stylistic thing of running issues up the flag, and testing public opinion. And that’s very much a style of the Key government, and I think Stephen Joyce has quite a bit to do with it. John Key’s favourite phrase is “Kick the tyres. 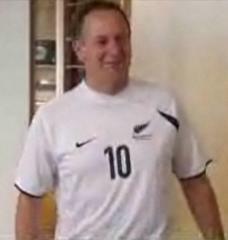 We’ll kick the tyres on this one.” Or : “We’re looking into this” and “ I wouldn’t rule that out.” On Red Alert, there was a hilarious post as to whether John Key would still be willing to support the All Whites at the next World Cup. Well, “I’d want to kick the tyres on that,” and “Certainly, if we were going to change my support, I’d let the public know beforehand.” It was very funny.